Found 3 file extension associations related to BlueStacks App Player for Windows and 3 file formats developed specifically for use with BlueStacks App Player for Windows. 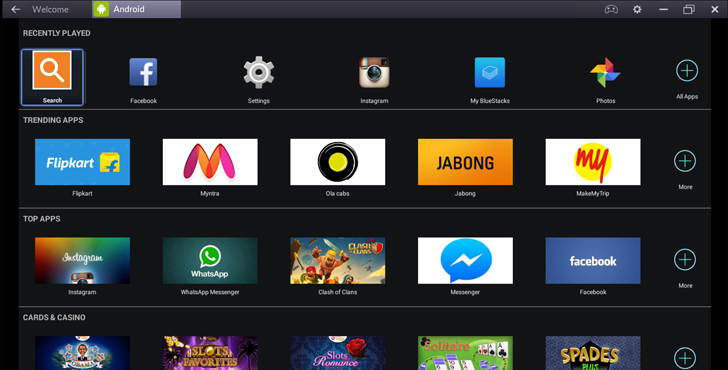 BlueStacks App Player for Windows allows users to play Android apps fast and full-screen and push their favorite apps from Android phone to their PC using BlueStacks Cloud Connect. It contains 10 pre-loaded apps "out of the box" and more apps can be installed. This application may not work fast on older netbooks and tablets and is available for Windows. Comes in Free and Pro version. It is supported by Intel, Samsung, Qualcomm and AMD. How to run Android apps in Windows - Using BlueStacks App Player to run Android apps from Windows Sidebar. If you need more information please contact the developers of BlueStacks App Player for Windows (Bluestack Systems, Inc.), or check out their product website.